Cloth wipes are the perfect compliment to cloth diapers. They are a natural alternative to disposable wipes and so much softer and cuter. I started off using disposable wipes when I was first using cloth and it just ended up being a pain. I had to throw away the wipes and put the diapers in the diaper pail. Sometimes the wipes would end up in the wash, which was kinda gross. I'm not entirely sure of what they put in disposable wipes, but I don't think it's very natural. I keep in a wipes warmer. I only use 2 Booty Cubes every 2 days and the water does not get nasty in that short time. I drop the cubes in warm water and they dissolve on their own. The warmer does need to be cleaned out this way. It's really easy and my babies love the warm water during diaper changes. I keep my wipes in a drawer in the same dresser as my diapers. I have also kept them in a disposable wipes container, or other plastic container near the changing table. There are many ways to store your wipes. You can keep them in a container wet so they are ready to be used. Sometimes sitting like this will cause them to stink though. You can also have a spray bottle or container of wipes solution and wet the wipe before use. It's really a matter of preference. Whatever way you do it, as long as it cleans your baby's behind it's all good. what Is A Cloth Wipes Solution? Cloth wipes solution is usually made from part water, part oil, part essential oil, and part soap. The oil is to help the wipes glide across baby's skin, the essential oil is for anti-bacterial purpose and for fragrance, the soap is for cleansing and the water is to help dilute it all. There are many variations of what can be put into a solution, but those main ingredients are usually there. You can find wipes solutions for sensitive skin that may not contain some of those ingredients. Wipes solution usually comes in many forms: cube, foaming, spray or liquid concentrate. To use wipes solution, you simple drop a couple of cubes or liquid concentrate into warm water and mix. Foaming solution is usually applied directly to the wipes. Once you have your wipes solution mixed together you can either keep it in a bottle (a plastic spray bottle or squirt top lid bottle works well) and use it as needed, or wet your wipes in advance so they'll be ready to use. You can even use a wipes warmer or a disposable wipes container for handy storage. There are many places to find cloth wipes solution. A few popular choices are Booty Cubes (my personal fav), Honey Chunks and London Frogg. You can find wipes solutions in a variety of delicious scents which makes diaper changing time all the better. What Materials Should Cloth Wipes Be Made With? 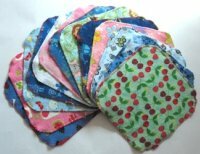 There are almost as many different styles of cloth wipes as there are diapers. You can find a variety of prints and materials to use, as well as wonderful smelling wipes solutions to use with them. A popular choice for cloth wipes is terry or flannel. Both of these materials are inexpensive and hold up well over time. You can choose from many different combination's of materials for whatever suits your needs. It's a good idea to have one side of the wipes smooth for wiping pee and one side textured to help pick up the messes. Velour is a great choice for wipes because it is velvety soft on your baby's bum. Terry or sherpa are great for wiping away poo. You can use baby washcloths for wipes, but I don't like them. They are too thin and a bit small. I have found that thin wipes soak right through which means whatever you are wiping gets on your hand. I use velour/sherpa wipes and they are perfect. How Much Should I Spend On Wipes? Cloth wipes can range anywhere from .70 cents each to over $1 each. It depends on where you buy them from and the material you have them made with. You can find many work at home moms who make great wipes for less than what you would find from a larger cloth diaper company. 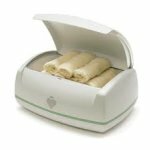 I highly suggest looking at Hyena Cart or Diaper Swappers for WAHM's who make wipes. You will get great products and often times get a discount for ordering in bulk. How Many Wipes Do I Need? How many wipes you needs depends on how many times a day your baby poops and how often you wash. I have found I don't need many wipes when I use cloth. Especially when you use a good wipe that is thick enough and has texture to clean poo. When my son was still a newborn and had explosive poops I had to use a lot, but that is a short time in a baby's life. I would say you would be safe with 2 - 3 dozen wipes. That would last you for 2 days, maybe more, depending on how often your child gets changed. I have 3 dozen and it's usually more than enough for 2 days. You will also need extra for the diaper bag. I have some flannel/terry wipes I use for the diaper bag. They are thinner and take up less room, but still work great. Cloth wipes are easy to take with you when out and about. You can put them in a small wet bag, a travel disposable wipes container, or just put them in them into the pockets of your diaper bag. You can bring along a squeeze bottle of wipes solution or water, or you can buy a bottle of foaming or spray wipes solution. Then you just wet the wipes when needed and put them in the wet bag with the dirty diaper. Just make sure you bring enough water or wipes solution with you, because trying to clean a poopy bum with little or no wetness on a cloth wipe is nearly impossible! You don't want to be stuck in that situation! If you do not want to buy cloth wipes solution, you can make your own. There are many recipes out there that are simple to put together and low cost as well. Here are a few recipes you can try out. Just gather the ingredients together and mix. Easy peasy.